Poor Man’s Lobster – What a great meal to put together for a dinner party or just a quiet night at home. The way this seafood is prepared brings out the freshness in the cod with no “fishy” taste. This recipe really does make cod taste like lobster! Updated: A few new photos have been created for this readers’ favorite! I absolutely love lobster. Every time my husband and I are out for a special dinner my mouth starts watering at the thought of this scrumptious delicacy (I live in the Midwest remember) being on the restaurant’s specials board. But even when it is, I seem to always pass it up due to the high price tag and the guilt I’d feel following the meal. Sad, right? Well, to turn my frown upside down I’ve learned how to make a mean broiled lobster tail for special occasions at home (buying and preparing it yourself costs roughly half of what you’d pay at a restaurant around here) and for a family dinner during the week, I opt for my tried and true broiled cod recipe we call Poor Man’s Lobster here in Wisconsin. The cod, when prepared as instructed below, has the texture and consistency of lobster and tastes almost like the real thing. I promise it will not taste “fishy” and your house will not reek of seafood for the next several days. People who don’t even like fish, like this recipe, and it’s been known to please even the pickiest eaters – AKA my children. I still haven’t shared the best part of this recipe. You know those days when dinner sneaks up on you or you’ve been at work all day and realize you never took any meat or fish out of the freezer to feed your family that evening? Yep, you know what I’m talking about. Well, this recipe is the ticket because you don’t need to thaw the cod beforehand. In fact, I prefer NOT to thaw the cod when I make this. Keep reading and I’ll tell you why. Poor Man’s Lobster is easy, delicious and healthy (for the most part). If you want to substitute the sugar with Splenda, fine. If you want to use less butter, fine. But don’t substitute margarine for the butter – it has too watery of a consistency. Roll up your sleeves, get your ingredients together and let’s make some Poor Man’s Lobster! It’s pretty safe to say this could easily become a staple meal in your home after you try it! For this recipe, you’ll need 6 (6 oz.) 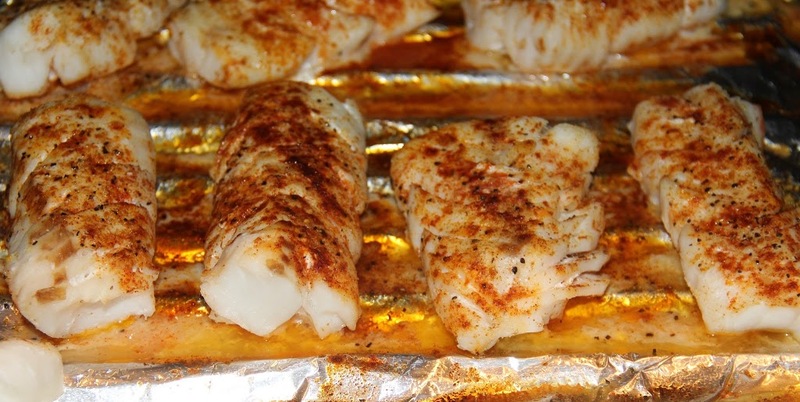 frozen cod fillets, 1 cup sugar, 6 cups water, 2 tablespoons salt, lemon pepper seasoning, paprika, 1/2 lemon and melted butter. Begin by covering a broiling pan with aluminum foil. 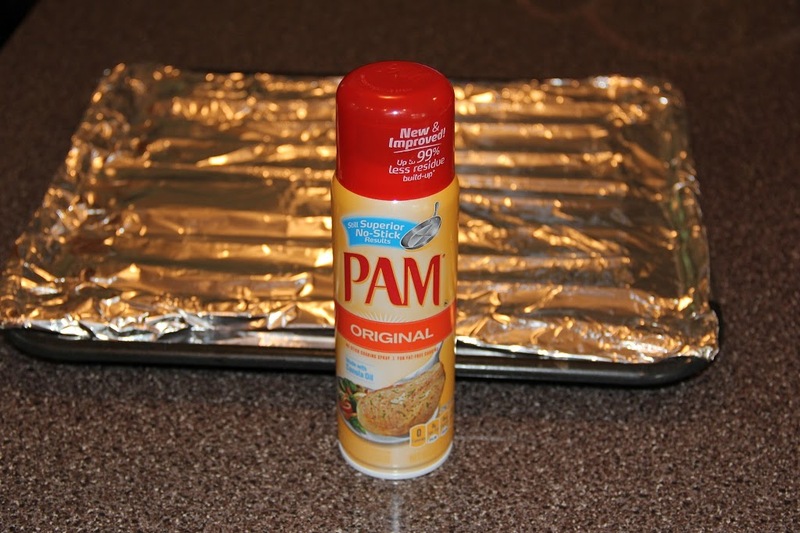 Shape the foil to the grooves of your pan to catch the excess liquid and spray with foil with nonstick spray. Next you’ll need 6 cups of water in a bowl, salt and sugar. 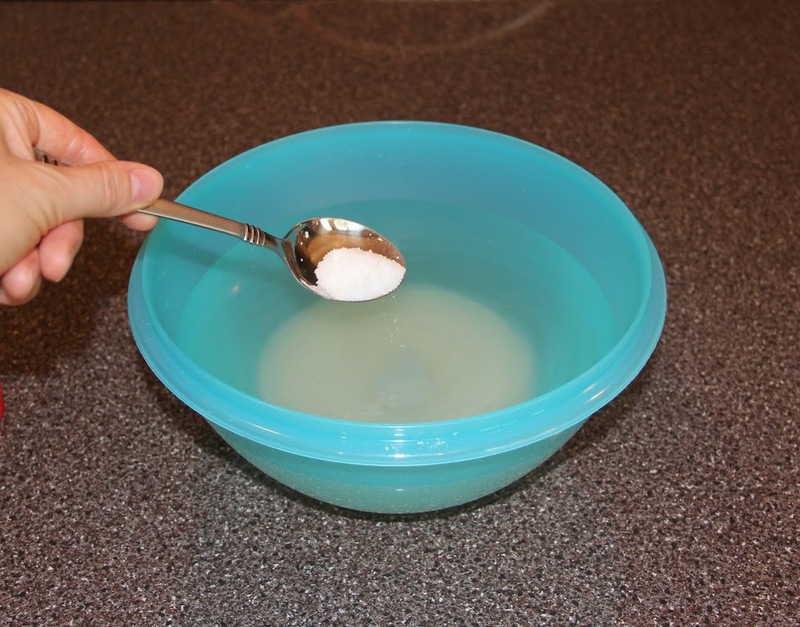 Add a cup of sugar to the bowl of water. Now add two tablespoons of salt and stir. Put the frozen cod fillets into a large saucepan. I used 7 fillets since mine were a little smaller than 6 oz. each. Pour the water mixture over the fillets. Bring the water to a boil for 3 minutes. Here’s where the frozen fillets come into play. 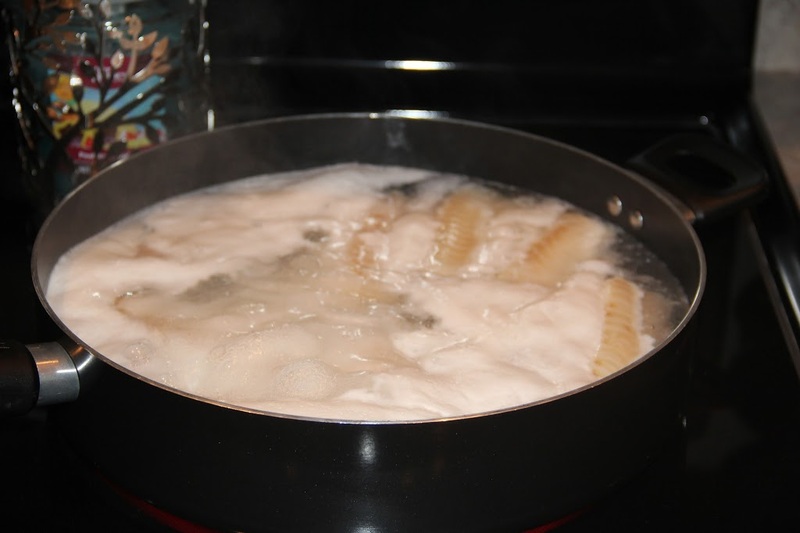 When you boil the fillets while frozen they’re less likely to break apart during the boiling step. Remove the cod from the water with tongs taking care not to break the fillets in half. 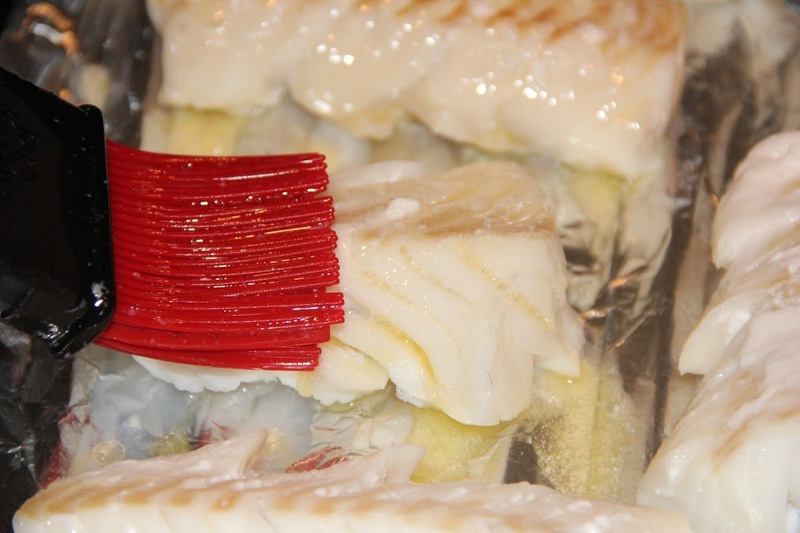 Place the cod fillets on the foil-lined broiler pan. 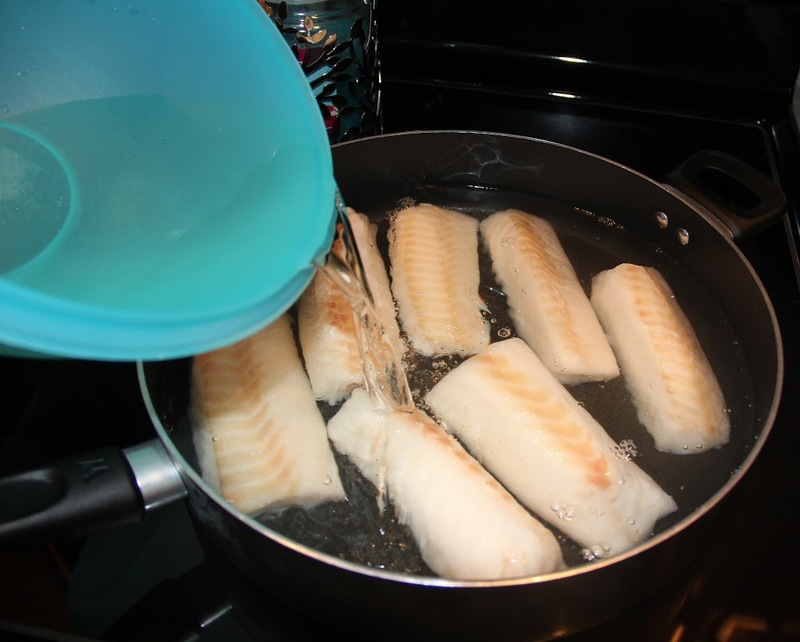 If you use something other than a broiler pan (like a cookie sheet) make sure to blot the excess water off of the fish. 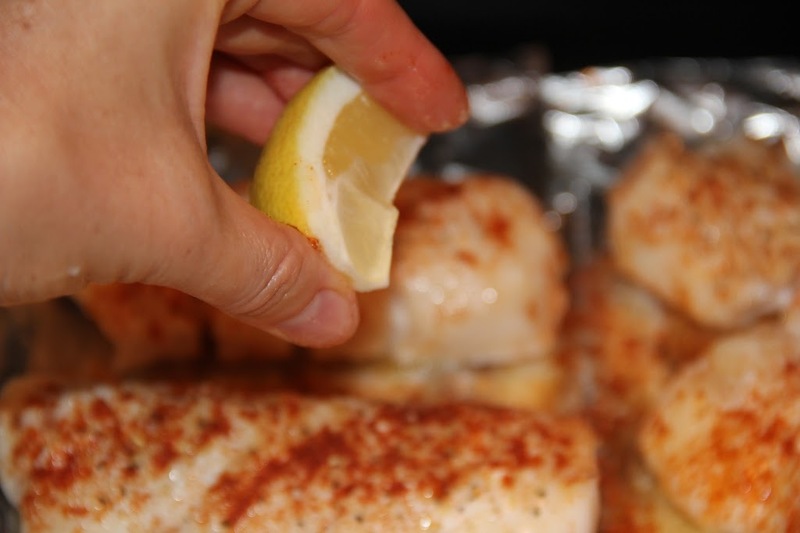 Using a broiler pan prevents the fish from sitting in the excess liquid when in the oven. Brush some melted butter on both sides of the fillets. Sprinkle on some lemon pepper seasoning and paprika. 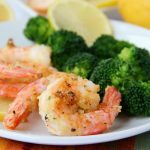 Squeeze some lemon juice over all of the fillets and put under the broiler for about 7 minutes or until fish flakes with a fork. I always broil mine on low. Here is my observer. 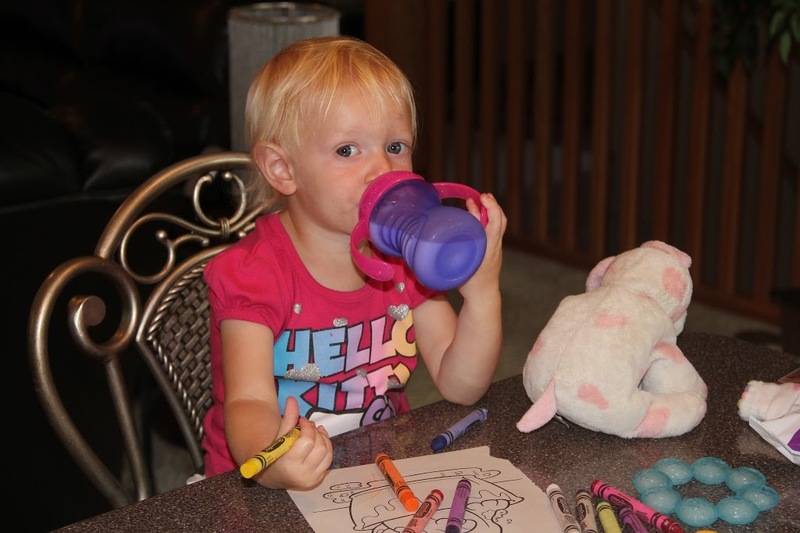 She colors while she waits for her dinner. Notice her favorite puppy next to her. He never leaves her side. Puppy gets baths weekly. Alright, where were we? Keep checking to see how the fillets are coming. When the fish turns an opaque white, you’ll want to pull the fillets out of the oven. Ummm, yum. This is looking really good. I love dressing up fish with lemon. 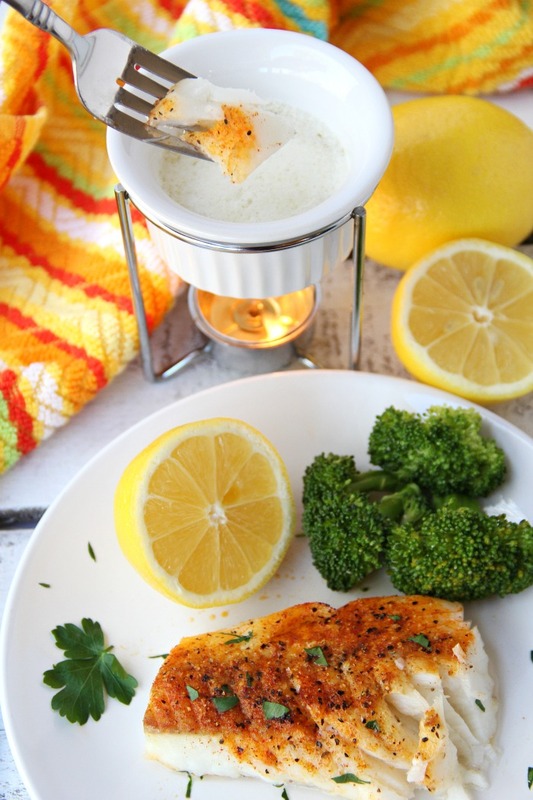 Serve the fish with some melted butter and get ready for the deliciousness! In Wisconsin, Poor Man’s Lobster is on most of our supper club’s Friday menus. Now, you can enjoy it right from the comfort of your own home! Hope your family loves this recipe as much as ours does! Craving more delicious fish recipes? I grew up on the west coast next to the ocean but didn’t appreciate seafood until I was much older and wiser. This recipe makes my mouth water. It looks awesome. I’ve never tried lobster but I am going to cook this recipe in the coming week and can officially say I’ve tried poor man’s lobster. I love cod! Yum. Thank you for sharing this recipe. That’s awesome, Stephanie. I sure hope you enjoy it! It’s definitely my favorite way to prepare cod at home! Am I reading this correctly? There are 205 grams of carbs per serving? I am diabetic, could you leave out the sugar? When I switched over to a new recipe card plug-in some strange things happened with the nutritional information on my posts. I’m going through as quickly as possible to remove the information because it is incorrect. So sorry about that! We can’t have sugar…Can I leave it out or substitute something else?? The sugar is what gives the fish the sweetness of lobster. If you leave it out, it just won’t be as sweet, that’s all. Hi Patty, I don’t include nutritional information with my recipes. One of the recipe card programs I had at one point automatically used to calculate that info but it never seemed to be accurate. I’d rather not include it than provide inaccurate information. Hope that makes sense. This looks amazing!!! Do you know if this would work with other types of fish? I keep tilapia on hand and would love to know if you’ve tried this with any other fish. Hi Monique! I’ve only used cod with this recipe. I’m wondering if tilapia might be a bit too delicate for the boiling water process that’s used at the beginning of the recipe. I would love to hear how it turns out if you decide to use tilapia. Believe it or not, we just had this tonight for dinner! It’s one of our favorites! I’m wondering if this could be done without sugar or sugar substitute and still come out tasting like lobster? Hi Kimberly, I don’t see why you couldn’t use sugar substitute. You’re essentially just sweetening the water the fish boils in before you broil it. Good luck! Hi Jill! You could try adjusting the ingredients, but you’ll want to make sure you cover the cod with the water mixture regardless of how many pieces of fish you’re preparing. Good luck and I hope you enjoy it! Just made this – delicious, and since I didn’t “dip” in butter, it was rather healthy with a small salad. Thanks for sharing. I’m so glad you enjoyed it, Debbie! This really is our favorite way to prepare cod! 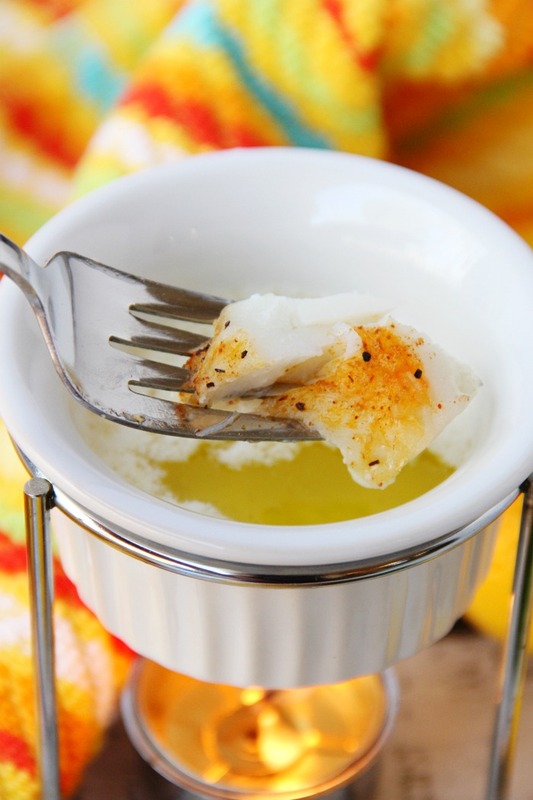 I have used both cod and haddock with this recipe and like it either way. I’m also from Wisconsin, and have made this since the 1970’s. I agree, Annette. 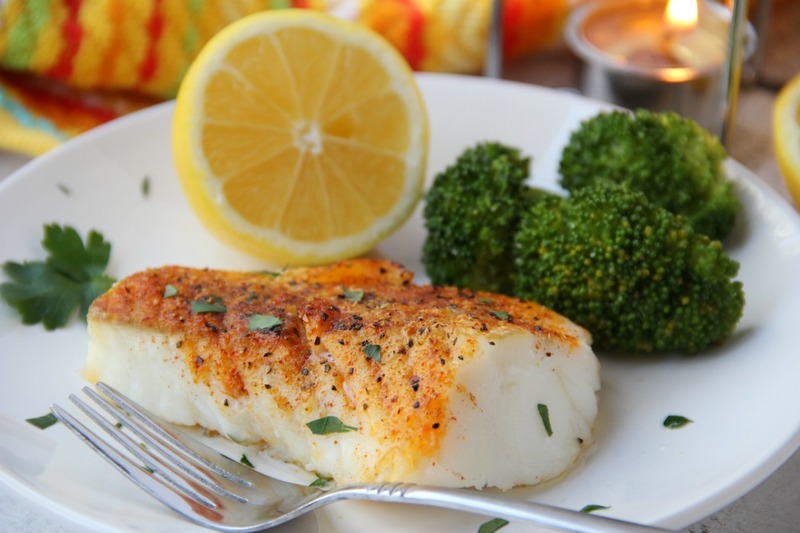 This recipe turns out delicious with both cod and haddock! I use olive oil with truffle salt and herbs de province. 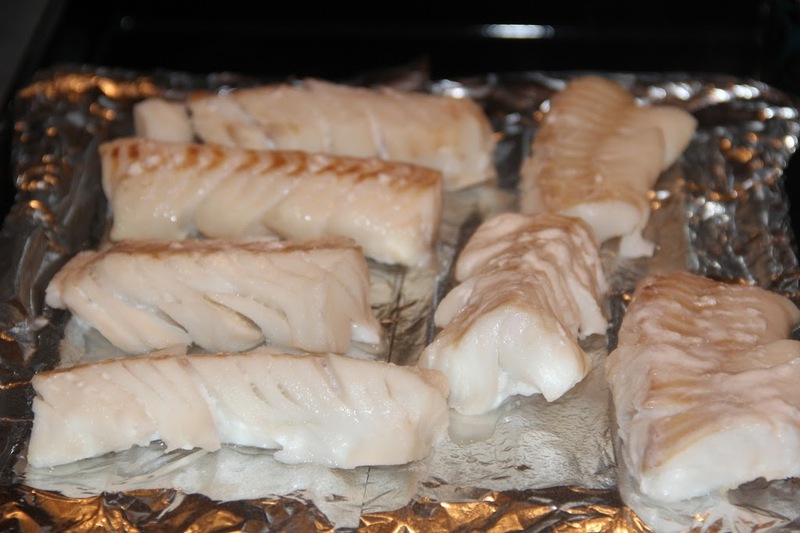 All ingriedents go onto a parchment paper, gently coat the cod and place in the center of a large square. Grind on lemon pepper to taste. Read about en papilote, which is a great way to cook. and fold and seal the paper. Cook 10-12 minues in toaster oven or oven. You can also put in some sliced mushrooms. Why use unhealthy sugar if you do not need to?. 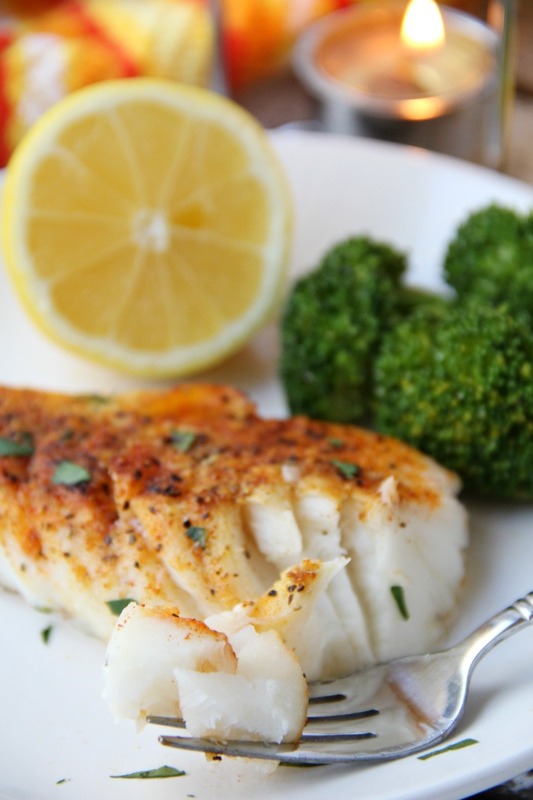 Cod is delicious pan sauteed, or fried, steamed or pretty much any way you cook it it has a lobster like taste. Frankly anything is good dipped in melted butter…Try something else…an Asian sauce, olive tapenade, a small bit of lemon preserves if you need the sugar. Go away! People like you really irk me with your unnecessary comments. This recipe is delicious as is. If you want to post your own recipe get your own blog and post it there. And thanks so much Sara. Your recipes are wonderful. Tried it for the first time for dinner today, loved it!!! I will cut on the sugar next time but I am curious as to why the sugar?? Lydia, the sugar helps give the fish that lobster-like taste. I’ve had other readers use Splenda for the recipe instead of sugar and they’ve been happy with the results, too! Great, that’s good to know, thank you! And I love that you post step by step pictures, I am a visual person and like to see what it is suppose to look like. how long do you boil the fish if it is not frozen? You can probably cut the time in half. If it looks like the fish is starting to break apart during the boil, it’s time to take it out! Trying this tonight with some friends….going to poach it at home and finish up at her house so it is nice and warm. Love lobster, and most shell fish so this FL girl is eager to see how this is. Excellent!!!! Since I am on a diet that allows no red meat, only chicken, fish and occasional pork, I will be eating this alot! I can’t wait to hear how it all turned out, Linda! I’m hoping the fish didn’t get rubbery at all after poaching and before putting it in the oven. Let me know how it was! I used cod and flounder. They was both wonderful. Thank you for the recipe. Maybe the pieces were thinner or smaller and you just boiled it too long. If you see the fish start to break apart at all, remove it from the burner and transfer to the baking sheet. It’s ready to go into the oven! As a Jewish gal, I don’t indulge in shellfish, but a co-worker kept talking about New England lobster rolls until my mouth began to water! I had to find an alternative and came across your blog post. I followed it to the letter, chilled the cod turned lobster, and made lobster rolls with it. My husband could not stop talking about the mean well into the next day! We’ve already decided we must make this recipe again very soon. Thank you! Oh, I’m so glad! Thank you so much for stopping by to share your experience. This is truly one of our family’s favorite recipes! Wow, that is a great idea. As I have adopted the kosher/biblical way of not eating certain foods. In fact this is how i found this recipe. I grew up eating everything seafood but no more. I was craving lobster or California rolls. Ive made the poor man’s lobster many times but never thought to roll it into sushi! Thanks for the idea! As a Messianic Jew, I know exactly what you mean. I wasn’t born into it so I know what shellfish taste like so I won’t lie, I sometimes crave it but refuse to eat it. I’ve made it and eaten it the way Sara instructs but Ive also made California rolls with it. Actaully, I made a deconstructed California roll salad. It’s awesome to have substitutes that allow me to make great meals for my family. Teaching my kids now how many substitutes and options they have. Sara, thank you for sharing this recipe and also the pictures for is visual learner! I’ve been using this recipe for a few years now. This was wonderful- and i didn’t even use cod, but skinny pollack, I just adjusted for that. Lobster lover me was fooled- can’t wait to fool my friends too, thank you! Oh, I’m so glad you liked it, Valarie! Thank you for sharing! This was such a hit last night for dinner thank you so much for sharing!! 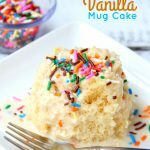 I love this recipe and so does my husband, but now I am on no sugar diet. Has anyone tried it without using the sugar? The sugar is what gives the cod the sweetness of lobster. I’ve never left it out, but I don’t see why you couldn’t. Maybe just amp up the lemon for some extra flavor? I wonder if you can use agave syrup? Unless you cant do any sweeteners at all? So glad to hear that, Ed! This recipe is one of our family favorites as well! I made this for dinner tonight – we loved it! The cod was a little on the tough side. I’m wondering if I over cooked it or maybe undercooked it? I can’t wait to make it again and want to get it right next time. I think I boiled it the right length of time, it was just starting to fall apart. Any suggestions? It sounds like you may have overcooked it a bit. Also, did you boil the cod while it was still frozen? If not, you may want to try that next time! Good luck and I’m glad you enjoyed the recipe! We just had it tonight, too!! I’m so glad you enjoyed it! When you broil the cod, do you move your oven rack to the highest level or do you just keep it in the middle? I can’t adjust my broiler heat, such as low, medium, high, etc. I normally will move my rack closer to the broiler. Just a quick “thank you” for this recipe. It is delicious, and my husband says it is much better than any of the restaurants in our area. Making this again tomorrow. It’s at least once a month on our menu. What a compliment. Thanks so much, Tina! 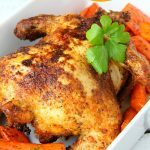 This recipe is one of our family favorites as well! I don’t have a broiler. Would a 450* oven work? It could. I’ve always just used the broiler. If you do try the 450 degree oven, have a meat thermometer read and consistently take the temp while the cod filets bake. You’ll want the cod’s internal temp to be at least 145 degrees Fahrenheit. I am not a lobster fan, but I AM a Wisconsinite, and grew up on Poor Mans Lobster. I prefer it to the real thing and appreciate the recipe! Thank you! Poor Man’s Lobster certainly isn’t difficult to find at any of the supper clubs here in Wisconsin. It’s always been a favorite of mine as well and I love that I can prepare it for my family at home! So glad you like the recipe! My husband is on a low sodium diet do you think I could make this with out the salt? I think it would be okay without the salt. If you try it, please let me know what you think! So good!! My broiler only has a “high” setting, so that’s what I used. Probably left it in there a minute too long, but it was still amazing. My husband couldn’t get enough of it and my kids liked it, too. The kiddo who doesn’t usually like sweetness in her dinner food liked it more than the one who does. Love that it starts with frozen fish, such a time saver! Thank you!! Jen, your comment made my day! I’m so glad your family enjoyed the recipe. I love that it starts with frozen fish, too! Makes things so much easier! 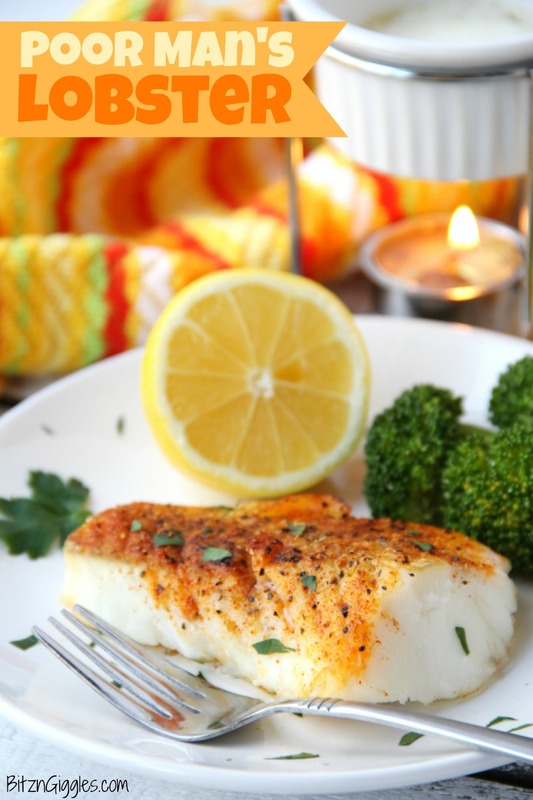 I tried this with swai fillets tonight – turned out awesome, and the family loved it! Swai is pretty thin (not as thin/delicate as tilapia, though) so I didn’t boil it as long and didn’t have it in the broiler as long either (especially since my broiler only has a “high” setting). Just wanted to post as I’ve seen other commenters wondering about using other fish. Thanks again for the awesome recipe! I’ve never heard of swai, but now you have me interested! I think I need to try it! 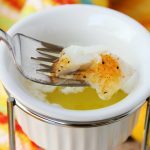 I stumbled across this recipie when looking for a new way to cook frozen cod since I love to cook it but thawing creates a bit of a mess. I am even more impressed that you have been responding to almost every reader’s comment for almost 4 years! That is awesome. Reader comments make me so happy. You all are the reason I do what I do! I really hope you enjoyed the cod. If you had a chance to try it, I’d love to know what you thought. Thanks so much for leaving a comment – I hope you stick around for more delicious recipes this year! This was so tasty! I had never broiled before but I’m so glad I did. 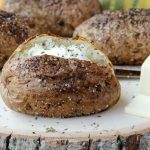 Thank you for posting this recipe my bf loved it and he’s picky about food. I just made this the other night for our family again. It’s one of our favorites. 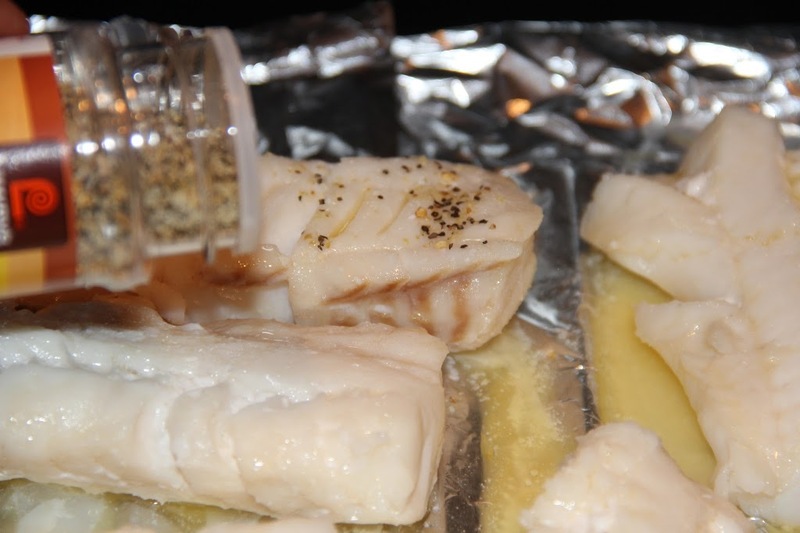 I love that the fish can be frozen before preparing – the broiling makes things so much easier, too! I’m so glad your boyfriend enjoyed it! Hi Kathy! Pickling spices, of course! Did you always just bake the fish in the oven rather than using a broiler before this? I have always just boiled the cod in water until done, did not use the broiler at all. Also, I have not used any salt in the water. The butter or tasty margarine besides pickling spices were all I used. I had poor mans lobster in AZ, I’m trying this for dinner, thanks so much for the recipe. Oh gosh… the pics of your daughter coloring and then just man handling the fillet of fish are hilarious.. going to try tonight! Thanks! I know, right?! Hope you enjoyed the recipe, Lindsay. Let me know if you made it! Well I believe I messed it up. The texture was… well not sure how to describe it. I’ll have to try again. 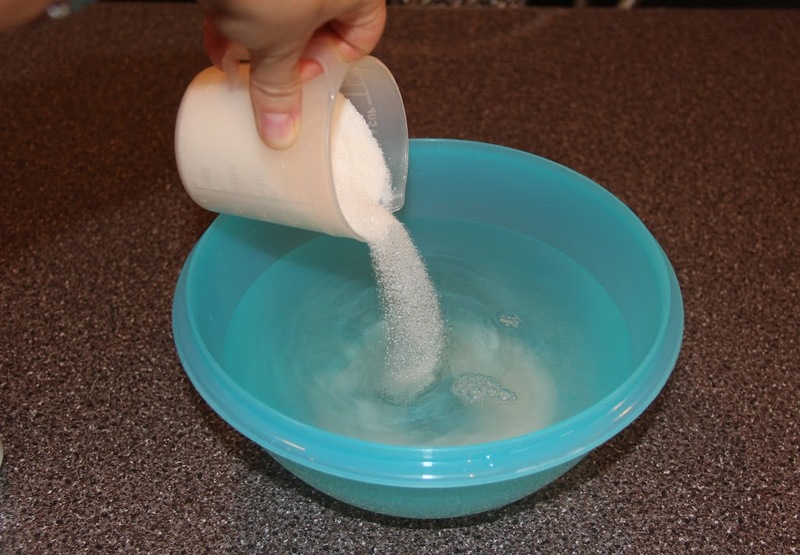 I made two bowls of sugar water because inky 4 cods would fit in one pan. Not sure what I did wrong. Was the cod frozen when you boiled it in the pan. If not, that could have been the problem? I am psyched about this recipe—my mom has gout and can’t have shellfish. Have you ever made a poor man’s lobster roll with it? She is visiting this coming week and my plan is to make this ahead and serve two ways: a) mayo based salad, and b) serve it hot on a toasted and buttered potato roll with drawn butter and chives. Thank you! I’ve never made a roll with the poor man’s lobster but your ideas sound delicious, Sue. I really hope your mom enjoys it. Let me know how it turns out! Can you use a different type of fish, like for instance swai fish? Or does it have to be cod? Thank you! I know readers have used other kinds of fish. I’ve always stuck with cod. I make mine boiled in 7 up. Not diet.. less sugar for us diabetes. Made this tonight. It was really good. I sprinkled the fillets with shrimp chili powder and paprika. Thanks for the awesome recipe. So glad you enjoyed the recipe, Joni! Hi Sara thanks for the recipe and tip, will definitely try it. I have a question: could the cod be substituted for lobster in seafood stuffed mushrooms? My wife and I really enjoy the seafood stuffed mushrooms when dinning at Red Lobster and liking to cook wanted to make some homemade ones. I was curious if the cod would work as one of the ingredients for the stuffing along with the crab meat, minced garlic, seasoned croutons and topped with mozzarella cheese. Any advice or tips you could give for trying this is greatly appreciated, thanks. Hi Rudy! I would make the Poor Man’s Lobster recipe first to see how you like the taste of the cod. If you enjoy it, then YES, I would definitely substitute this cod for the lobster. I bet it would be delicious! Good luck and let me know how everything turns out! Cant wait to try this. Was recently diagnosed with a shellfish allergy. This made me really bummed because lobster and shrimp are favorites of mine. Now I can still eat my “lobster” without needing a side of benadryl. I hope you enjoyed it, Mariel! This was excellent!! I used fresh cod, but froze it for a couple hours prior to boiling. I also used artificial sweetener. Tasted wonderful! Both my husband and I enjoyed it! Will definitely save this recipe! I’m so glad you and your husband enjoyed the recipe, Dayna! Thanks for taking the time to leave a comment.